1. Classic Malts-style: This specific one is not a Classic malts glass, but the shape and dimensions are the same, I measured it against online descriptions of the Classic Malt branded glass. (I will have to order some “genuine” ones soon…). This is the largest glass in the lineup and this style has been around for quite a few years and is well-regarded. 2. Copita: A classic shape used by whisky blenders, apparently derived from sherry glasses. A more narrow glass and the one with the smallest brim diameter in the lineup. I have several different ones, all with minor variations – give or take a mm here or there, but I have settled for a Cadenhead’s branded one in the standard blender’s glass shape. 4. Stemmed tulip-shaped nosing glass: I have no idea what this style or brand is actually called, it’s not unlike a Bugatti glass, but with straight sidewalls at the end. You could also call it a slightly smaller Glencairn on a stem. 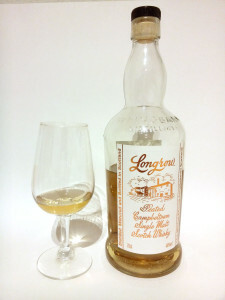 Another classic style you encounter quite often, this specific one is a branded glass by Springbank. 5. Rastal Harmony. This is the “control-glass” in this lineup with a very different shape of the sidewalls. It’s also the smallest glass in the comparison. I got it at a whisky festival last year and wasn’t very convinced then, but I had no comparison at the time. Let’s see how it holds up. The way I intend to do this comparison is straightforward: I will use three different whiskies of three different styles (unpeated triple-distilled, heavily peated, sherried). 20ml will be poured into every glass. I will compare the glasses immediately after pouring, a few minutes in and then after ten or even more minutes. The glasses will be judged by nosing comparison and I will then assign points to each glass – the best one gets five points, the worst glass one point. At the end we’ll see which one came out on top. Right after pouring we get a full and rich flavour profile, very small alcoholic tingle. It “feels” very roomy with a good air to whisky mix. After several minutes have passed, we still have a rich representation of the whisky, the citrus notes are there, but not overpowering and the sherry casks in the mix really shine. 20 minutes in (this was the first glass poured) this is still going strong. Right after pouring it feels fresher, more minty with more alcohol than the first glass, the nose feels restricted. After several minutes the base style hasn’t changed – it remains more alcoholic and the lighter citrus notes are enhanced, whereas the darker notes are more muted. 15 minutes in it remains largely unchanged – the most fresh and alcoholic nosing glass in the lineup. Full and rich aroma after pouring, more fresh notes than in the classic malts glass, but less than in the Copita. Lots of room for the nose as well. After a few minutes this glass has improved considerably. It still sits between the classic malts and the Copita, but the darker notes are much more pronounced now. 15 minutes in the aromas have faded a bit, especially the light ones, but still the next best performance after the Classic malts style glass. Now there’s a surprise! Despite being smaller than and similar in shape as the Glencairn, this is not as fresh and alcoholic, delivering a mellow (for me preferential) olfactory experience similar to the first glass, but with the tradeoff of an overall less intense experience. After 15 minutes the aromas get very weak, comparing it directly to the first three glasses. Very hard to swirl without spilling! Not too alcoholic, but the most muted in terms of aroma representation out of all five glasses immediately after pouring. After several minutes a vanilla note is rather apparent, not found as intensely in any of the other glasses. It fails to define both the citrus and the darker notes as clearly as the other glasses, the whisky becomes quite “dull”. The Classic Malts style glass delivered the best performance for this 12-year-old Hazelburn, defining both the light and the dark aromatic components over a long period of time. The Glencairn was a close second, but it showed a bit more change in the whisky as time went on, progressing from a fresher to a darker style. The Copita stayed consistent throughout, but with more alcohol than I would’ve liked. It probably works best when used for evaluation of diluted whisky samples? The other two glasses were not as impressive overall, with the Rastal sadly being very one-dimensional and not suitable for this style of whisky. Right after pouring we get a creamy mixture of lighter and sweet sherry notes, the 46% ABV are noticable, but not overpowering. After a few minutes the whisky has settled and we get a very unbiased representation of all flavour components from fruity, sweet and spicy to slight citrus and alcohol. The same is still true after 20 minutes – a very consistent performance. This glass also accentuates the alcoholic, lighter notes right after pouring, just as with the previous whisky, the sherry base doesn’t quite shine through. Just as before, this glass also accentuates the lighter components even after several minutes have passed – and the same again after 20 minutes. This is too alcoholic-centric for this type of whisky. The Glencairn also accentuates the lighter, fresher notes right after pouring, but more of the sherry shines through. This seems to sit in between the first two, again. Slightly more spices than with the Classic malts glass. After several minutes the Glencairn also settles down and represents all flavour aspects, with a slight bias towards the lighter notes. After 20 minutes it’s still the same – no deterioration, but the definition of the different aromas is ever so slightly better in the first glass. This is, again, confirming the previous findings – it is less expressive than either of the three previous glasses for the fresh pour. A bit muted, but biased towards the sherry components, which I prefer over the Copita for this dram. After several minutes all aspects of the whisky are represented, but it is starting to fade slightly. After 20 minutes it’s slightly more closed down than the classic malts-style glass and the Glencairn, but it still works better than the Copita. Where did the cloves come from all of a sudden in the fresh pour? This glass seems to prefer herbal /spicy components in whisky! Again, it does neither accentuate the sherry style nor the lighter components, it’s just a different, not really representative interpretation of the whisky on the fresh pour. The same stays true after giving it several minutes to settle and breathe, and there’s no change after even 20 minutes. 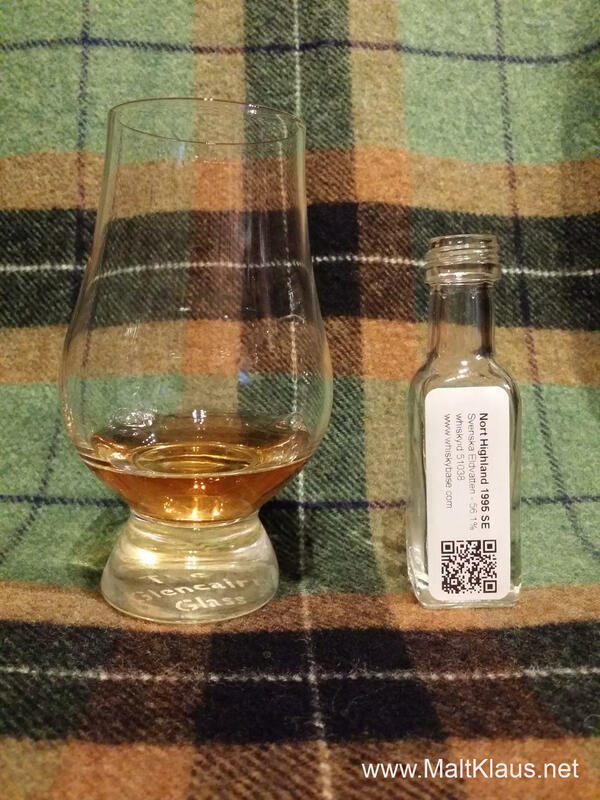 For the sherried Speyside whisky the Classic malts-style glass is ever so slightly better than the Glencairn, rendering a few nuances and details in better definition, but they are very close – I can’t see a difference in scores using either of them. The Copita was too alcohol-driven to suit the style of the whisky and the Rastal glass was no match for the two winners. Even this cask-strength whisky is not too overpowering alcohol-wise right after pouring. The slight vanilla ex-bourbon sweetness is rendered just as well as the signature phenolic and peat smoke notes. Several minutes in I’m still very happy with this glass – all aspects are represented equally and in balance. 25 minutes in the whisky is still fresh and punchy but with the same, consistent balance. With this freshly poured peated malt the Copita actually works quite well, since there’s not that much of a sweet, dark, oaky base. The alcohol is also well-tamed, or at least not much more noticeable than in the previous glass. The same is true several minutes in, but the difference to the first glass is more apparent now – the Copita again overrepresents the lighter aspects of the whisky. No change to that observation after 25 minutes. The Glencairn also works very well for the freshly poured Laphroaig, but, again, a slight preference of the lighter notes (including the peat smoke) over the base cask sweetness. A few minutes in it has settled down and works very well, but, again, there’s a slight shift towards accentuating the lighter notes. After 25 minutes there’s no significant change – good balance, but shifted slightly towards the lighter notes. I might score the whisky in the Glencairn one point less than the one in the Classic malts-style glass. This style of glass accentuates the vanilla notes and actually suppresses the smoky ones on the fresh pour compared to the previous three glasses, rendering the whisky in a bit more boring way and the same is still true several minutes in. 25 minutes in, it still is slightly more boring, less peaty and alcoholic than the other three glasses, but I prefer it to the harsher style in the Copita. No real surprises there in the third round – Classic malts-style and Glencairn are the clear winners! Looking back on my experiences, the biggest glass, the Classic malts-style one, offered the quickest results, a very consistent performance even with a whisky in the glass for 30+ minutes and a great definition and balance of the flavours in all three glasses. Alcoholic sting was minimal, which I really liked. A very close 2nd place goes to the Glencairn glass. It needs a few more minutes to reach peak performance with all the whiskies I tested, but manages to hold that level. Separation of aromas is also very good, but it has a tendency to accentuate alcohol and lighter aromatic components more than the winning glass. Because of that, the Glencairn might perform better for standard whiskies at 40% ABV – something I will need to try another day. There’s a huge performance gap following these two glasses. Both the tulip shaped one and the Copita have their faults. The Copita was consistently too alcohol-forward for me in direct comparison and the tulip shaped one was a bit too muted, accentuating the darker aromas while suppressing the lighter and peaty ones. And then there’s the last place for the control glass. This is widely sold as a whisky glass, but I cannot recommend it for this purpose. It renders aromas differently than all the other glasses, muting them overall while accentuating herbal/spicy/vanilla-style components. This could work well for clear spirits – but, sorry, it’s not a whisky glass – for me at least. So, going forward this comparison has a few consequences for myself: I will retire my copitas and tulip-shaped stemmed glasses to the display cabinet. For my tasting notes I will change my standard glass, using the Classic malts-style one going forward (again…) – and I will get an “original” one soon, even though I don’t expect it to be different in performance to my unbranded same-style one I got as a freebie from an online whisky merchant. Free stuff can be good! If you see distillery-branded Glencairn glasses (I buy one at every distillery I visit) in my future pictures accompanying tasting notes, these will mainly be used for the sake of taking the picture, unless I find them to work better for a particular whisky. For my regular (non-tasting) dramming I will continue to use my cut crystal Glencairn glass. I just love the look of the crystal glass and the weight and heft of it. Now if they only made these Classic malts glasses in great quality crystal glass – possibly also mouth-blown…. What do you think? Which whisky glass(es) do you prefer? Let me know in the comments section below! It would be really interesting to have a truly blind test of the glasses. Somehow. Personally I use a glencairn for tasting because I always have, and it keeps consistency in my tasting notes. In terms of just drinking though, I prefer a tumbler style glass, but with the sides drawn in to the middle to focus the aromas on the nose. I find it more relaxing than a tasting glass. Thanks for your comment, James! 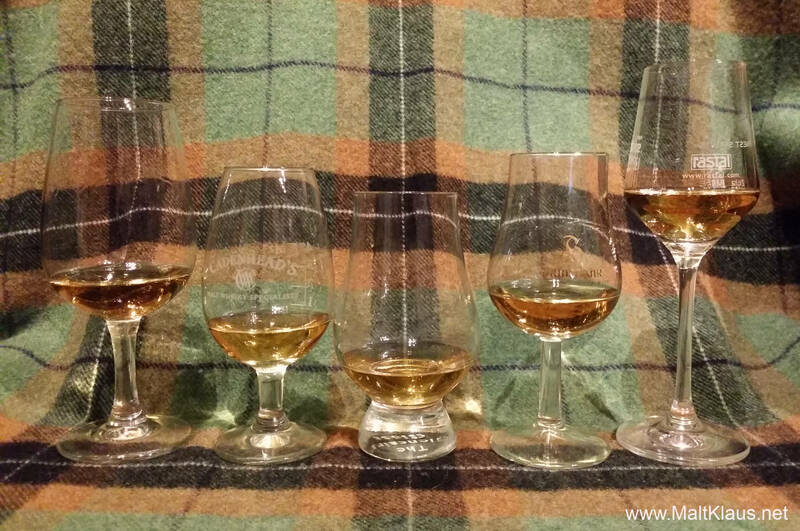 A blind comparison would be tough to accomplish, though and I tried to stay as neutral as possible, I went into the comparison having used all of these glasses before and with the Glencairn as a slight favourite, which actually ended up second. But glassware is also a personal preference – I like a glass I can hold in my palms to warm the contents up on colder days and don’t really like tumblers myself. Exactly – it’s all personal preference. As is whisky. But it’s good to have some scientific style analysis of things as well, because it saves me the pain of going out and getting a copita, say, as I know I’m already happy with my glencairn. My tumbler has a rounded bottom as well, so it’s a lot easier to hold in your palm. I can’t describe it too well. It’s interesting that you conclude the ‘quickest’ is the largest glass. When I ran this test a few years ago I found the ‘quickest’ was by far the Spiegelau which is considerably larger again, however, it soon faded and there was little nose left by the time the (slower) Glencairn started to work. What I did find was that the Spiegelau, although fading, was by far the best glass for lighter drams like Rosebank, Inchgower .. etc …… not only was it quicker to get going but provided much more to the nose than any of the others. May I add my link? Well, yes, Keith, I was quite a bit surprised by how stable and quickly the largest glass seemed to work. I do not have a Spiegelau – and am not exactly keen on purchasing one after I heard your comments. I am a slow sipper, so the downsides outweigh the positive attributes.